UDM Downloads > Top DVD Audio Ripper! Top DVD Audio Ripper is an efficient utility for ripping your DVD audios. You can rip your DVD audio to MP3, WAV, OGG and WMA formats. Audio ripping and file format conversion are executed at the same time, ensuring a fast ripping speed. There is a provision for you to edit the music file information so you can specify the output specification of the audio file before ripping. 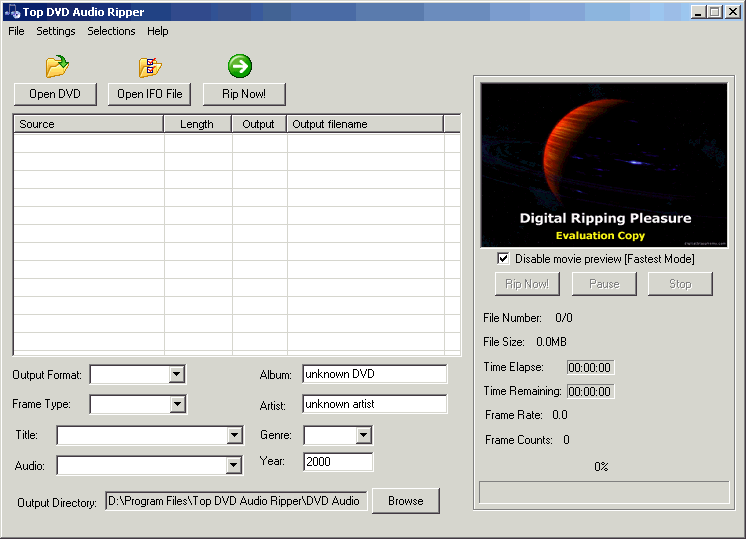 Top DVD Audio Ripper supports batch file ripping. You can choose the chapters of the DVD to convert or rip. This makes the audio ripping utility extremely flexible and easy to use.